These figures are made in Trollcast resin not white metal. 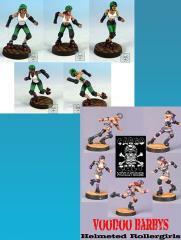 Includes 5 Helmeted VooDoo Barbys which are a licensed roller derby miniatures team from Cargo Cult Miniatures. Also included is the 5 player Helmeted Roller Derby team from Impact!. 10 unique helmeted roller derby players for you to use with Impact City Roller Derby.